Another one of my favourite ways to enjoy pork. Our trip to Vancouver to once again enjoy a tonkatsu japadog just won’t come fast enough so I had to make some here at home. So nummy, so easy, and really not that bad for you. Avoiding the deep frying really does that. I also modified the breading so that we get more fibre out of it. It’s been so busy and hectic over here, with japanese being my comfort food I guess it comes as no surprise that here is another japanese style recipe to share. Hehe. I love the crunch of this dish, it tastes and sounds like naughty! Being a huge ketchup lover that tonkatsu sauce is nothing but epic win for me. Combine the first 8 ingredients in a bowl and set aside. Combine the panko and potato flakes in a plastic bag. Add the chops or pork strips to the bag and shake to coat. Arrange the coated pork on a baking sheet and bake at 450F for 20-30 minutes. Serve with a drizzle of the sauce you made. Serves 4. Each serving contains 244 calories, 7.9 grams fat, 13.9 grams carbs, 2.4 grams fibre, 26.2 grams protein. Great on a nice sticky rice or shredded cabbage. 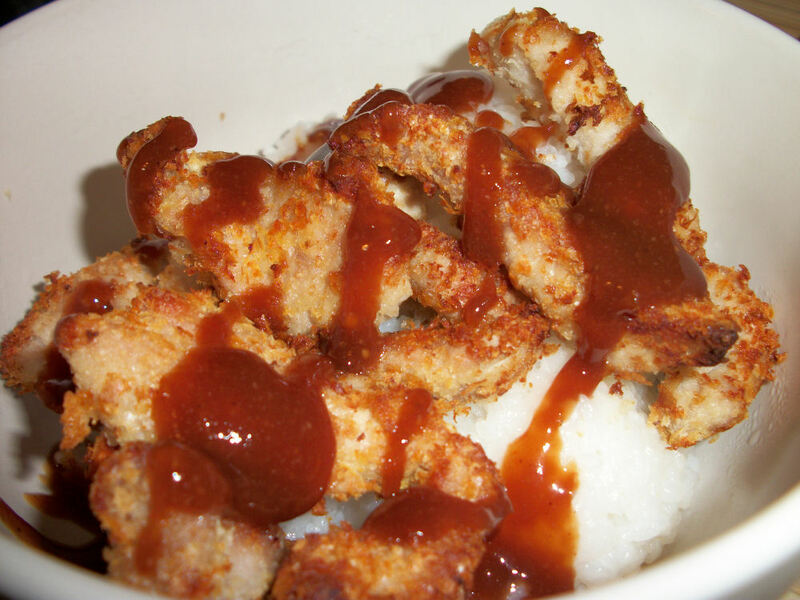 This entry was posted in Comfort Foods, Craving Buster, Dinner and tagged hoisin, ketchup, panko, Pork, Potato, soy sauce. Bookmark the permalink.